An anti-soccer betting ad, commissioned by Singapore’s National Council on Problem Gambling, on display at a taxi stand in the city-state’s central business district, on July 9. SINGAPORE—Germany’s stunning 7-1 win over Brazil in Tuesday’s World Cup semifinal dispensed delirium and despair to fans from both nations. In Singapore, the result has left advertisers red-faced over an unwittingly prescient campaign. 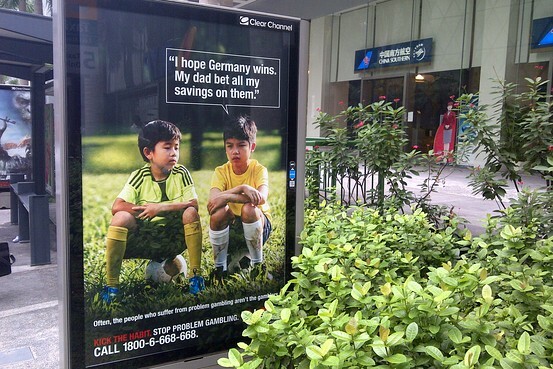 Over the past month, Singaporeans have been subjected to melancholic television adsand posters featuring young “Andy,” a fictional but troubled boy whose savings were used by his father to bet on Germany’s crowning as world soccer champions. Commissioned by Singapore’s National Council on Problem Gambling, the ad was meant to “deter gamblers from gambling irresponsibly during the World Cup,” according to localad agency Goodfellas, which produced the campaign. But as Die Nationalmannschaft crushed the Seleção in record-breaking fashion, soccer-mad Singaporeans quickly surmised that Andy’s dad was better off keeping his bets on the table. “Looks like the boy’s father who bet all his savings on Germany will be laughing all the way to the bank!” Singapore’s Manpower Minister Tan Chuan-Jin wrote on his Facebook page during the semifinal. At halftime, with Germany leading five-nil, broadcasters ran the commercial again, reminding viewers of the worldly riches that may spring from a well-placed bet. Images and comments lampooning the ad promptly went viral on social media. Neither the government-backed NCPG nor Goodfellas have offered any insight into their apparent act of clairvoyance. A Goodfellas executive referred The Wall Street Journal’s queries to the NCPG, which didn’t immediately respond to a separate request for comment. Even so, some Singaporeans are hailing the NCPG as their country’s latest soccer oracle, following in the footsteps of Paul the Octopus—a now-deceased cephalopod that correctly predicted the outcome of each game involving Germany at the 2010 World Cup, as well as that year’s final won by Spain. There’s still time, however, for a final twist in Andy’s tale. Germany, aiming to win its fourth World Cup title, must still overcome either Argentina or the Netherlands in Sunday’s final, and break a historical hoodoo—no European team has won the tournament when it was hosted in the Americas. Previous PostThe Winds of Folly – Seth HunterNext PostGuy Loses Poker Bet And Has To Get RIDICULOUS New Name.